Listening in on conversations between Russian cosmonauts What do people talk about during a spacewalk? Is it all work and serious, or are there lighter moments? RIR tunes in..
Two Russian cosmonauts stationed on the International Space Station (ISS) ventured outside on August 10. Commander Gennady Padalka, and flight engineer Mikhail Kornienko completed several tasks like cleaning windows, clearing debris samples from the station’s solar panels, installing mounts for new antennas, and taking photos of the Russian orbital segment. RIR followed the mission’s live online broadcast and listened in to their chatter to hear what Russian spacemen talk about. Cleaning a space station’s windows is not easy, and the cosmonauts said they could not find a comfortable position to do it. Padalka: Is it OK like this? I’ve pinned you down from the top. Well? Kornienko: Just wait, we’ll be comfy soon! Kornienko: Finally! The ideal position is found! Padalka (to Mission Control): I’m sitting right on top of it, Artyom! And that’s the most comfortable way to do it! Kornienko: How come your fingers are not freezing? Padalka: You’re the one who is freezing all over. I can’t catch a break. I’m working all the time. Kornienko: You know, I’m also going at it tooth and nail. Padalka: Then you’ve got an attitude problem. Kornienko: Me? I’ve got an attitude problem? OK, fine. Oleg Kononenko is another member of the Russian crew at the ISS, who stayed inside the station during the mission. But his friends never stopped joking with him. Padalka: Well Oleg, did you take some photos of me, or what? He’s so gorging himself on ‘borsht’ right now. One of the mission objectives was to take photographs of the Russian orbital segment of the ISS. But while at it, they took a couple of photos of themselves. Kornienko: By the way, when I took pictures of you I was facing the Sun, so the iPad only got your legs. Padalka: Why didn’t you tell me? You should have told me! Kornienko: It’s not a big deal, we’re going to take some more! Kornienko: I’ve been enjoying it for five months now! Kornienko: Where are you? I bet you’re hungry. Padalka: Not just hungry, I’m out of tea… Enjoy the night while you can, Misha. The ISS Expedition commander Gennady Padalka holds a record for the most time spent in space. When he completes his current mission in September 2015, he will have spent 878 days in orbit. 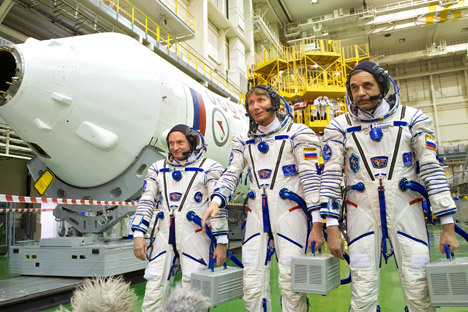 In an interview with NASA TV, U.S. astronaut Michael Fincke, who holds the American record for most time in space with 381 days, said Gennady was the best “newbie trainer” in the world. The spacewalk was the second extra-vehicular mission for Mikhail Kornienko.